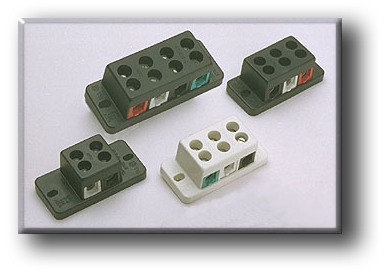 Eagle Connector C-Series terminal is a power input field wiring terminal block offered for commercial appliance and industrial equipment applications. The terminal block is a one-piece, dead front connector with color coded circuits. The C-Series is rated for loads up to 85 amps and for wire as large as #4 AWG. Large 3/8 inch diameter, screwdriver entry holes allow wire connections to be made with 1/4 inch flare point screwdrivers, the most common screwdriver size. Call us for free sample terminal blocks. Call us to help solve your custom terminal block requirements.